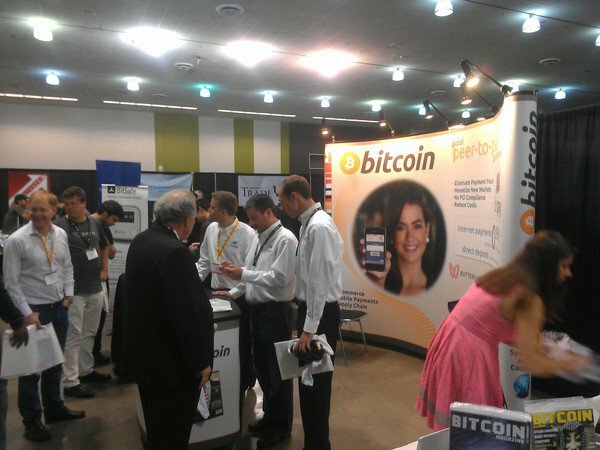 Yesterday was the first day of Bitcoin 2013, the first major Bitcoin conference of the year. There were no presentations yet, other than an opening address including Cameron and Tyler Winklevoss, but right from the moment businesses started setting up their booths around noon the conference room was teeming with life. Over a dozen booths were present, with nearly every major business – BitInstant, BitPay, BitcoinStore and more, having some representation. For long-time Bitcoin users, events like this are particularly emotional; here, for the first time, we are able to see fellow Bitcoin users, whom we have loved, worked with and had heated arguments with over forums or skype/IRC chat for many months or years as something more than just a username. Entire companies, existing only “on the cloud” before this day, are finally reunited – I myself had this experience finally meeting Tony Gallippi and Elizabeth Ploshay. Officially, the main attraction of today was the exhibitions. Many established businesses in the Bitcoin community were present, but there were anso a number of companies that have until now barely had any public attention at all. 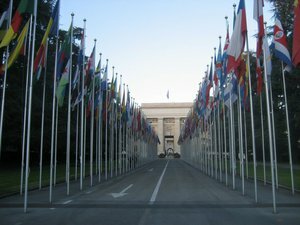 Here is a listing of some – although certainly not all – of the interesting ones. Mycelium – the Bitcoin Card has been around as an idea for a long time; the Internet Archive shows the site existing since as long as March 2012. The basic premise is that the Bitcoin Card will be a standard credit card-sized (including the thickness) Bitcoin hardware wallet, including some mesh networking features to help facilitate in-person Bitcoin payments. Many assumed that the company had simply faded away like so many other idealistic software efforts, but it turns out that it is still going strong – in fact, it is Bitcoin 2013’s premiere sponsor. We’ll have a more in-depth look at what this company really has in store in an upcoming issue of the magazine. Bitcoin Armory – the Bitcoin Armory project had two representatives showing its newest features: printer-safe paper backups (you need to write down a small portion of the code by hand so that a corrupted printer could not steal your money) and M-of-N paper backups – just in time after I wrote an article suggesting that people use such a feature. Free State Project – one thing that the first day of the conference has made very clear is that the US liberty movement is endorsing Bitcoin like never before. Free Talk Live, one of the movement’s most popular radio shows, broadcast its latest episode live from the conference. Bitcoin Not Bombs, Fr33 Aid and Lamassu’s Bitcoin ATM, all affiliated with the project, were present, and although Open Garden is not affiliated with the FSP directly its representative was seen with many stickers supporting the movement on the back of her laptop. BitPay – the company’s CEO Tony Gallippi has become a celebrity in the Bitcoin world for the work that the company has been doing getting Bitcoin merchants signed up (at the conference, Gallippi announced that they now have 7000, and are gaining 100 per day), and especially so after the recent $2 million investment round by Peter Thiel. BitPay’s main competitors, Coinbase and BIPS, were also present. Lamassu Bitcoin ATM – this is one of the two Bitcoin ATM projects that we have all been waiting for, run by Josh and Zach Harvey. This one only goes in one direction; you feed in a USD bill, make your phone’s wallet application show the QR code of your receiving address, put the phone against the scanner, click “confirm”, and voilà. The system did not always work; if the machine’s Bitcoin balance was supplied in a single transaction, the first purchase made will work, but the second may not if it occurs too soon afterwards. The reason has to do with Bitcoin’s concept of “change”; one limitation of Bitcoin is that transaction outputs must be spent all at once; if you received 20 BTC but want to send 5 BTC to someone else, you need to send the entire 20 BTC, but simply have a 15 BTC output redirecting back to yourself. However, while the 15 BTC is not yet confirmed, some Bitcoin wallets do not allow you to spend it, so your Bitcoin balance would temporarily reduce to zero. The problem is an inconvenience, but it is not critical; the obvious quick fix is to simply feed the machine with many transactions of 0.1 BTC each rather than a single large transaction. Today and tomorrow, the focus of the event will be presentations and panel discussions. Everyone who is at the conference can feel free to talk to me personally or buy issues 7,8 or 9 of the magazine at Bitcoin Magazine’s corner of the BitPay booth. Issue 10 will be going to print very soon as well. Continue to enjoy the conference!